Occasionally I have been asked where PRV's factory site was located. So I have decided that a page dedicated to this is appropriate. The area now known as "Park Royal" grew out of the Twyford Abbey estate whose origins date back to the Doomsday book. Early in the 20th Century the Royal Agricultural Society acquired land from the estate with the intention of locating a permanent exhibition there. It was these show grounds that gave the name "Park Royal" to the area as, in 1903, the then Prince of Wales (Prince Albert Edward Wettin Saxe-Coburg-Gotha, "Bertie", later to become King Edward VII) opened the show and the area was named "Park Royal" in his honour. The continuation of the show at the grounds was a failure and the grounds were used by the Queens Park Rangers football club from 1904 until sold in 1907. The background building in this picture is the gateway to the grounds of the Royal Agricultural Show circa 1903. What happened to the building thereafter is unknown but it must have survived through to the late twenties as this image would confirm. Park Royal Vehicles Ltd. was located at Abbey Road, Park Royal, London, N.W.10. (Later NW10 7SL). It had the telephone number ELGar 6522 and the telegraphic address of KOACHWORKS HARLESden LONDON. The drawing office was on the upper floor, taking most of the right hand side from the entrance, and on the second picture the window immediately to the right of the center on the upper floor was where my father's desk was. This building is now demolished. It was located at the inner bend going north along Abbey Road. Please click here for a Google map of Abbey Road as it is today. This will open in a new window where you can compare it with my overlay to the right. My overlay showing the location of PRV in red as it was during the 60's. Referencing today's map, Central Way did not exist in the 60's. Cumberland & Whitby Avenues existed along with Central Middlesex Hospital but there was no roundabout; Abbey Road and Cumberland Avenue met at a "T" Junction. Coronation Road & Acton Lane and the roads to the south are largely unchanged. Evidently most newer development occurred after PRV closed in 1980 when Commercial Way was carved through the site and Central Way's environs and everything north of Acton Lane to the Grand Union Canal took out the allotments & fields. An aerial view of the works can be found here. Comparing my overlay, the main offices were located on the inner bend of Abbey Road (near where Commercial Way now joins). Entrances to the factory site were just beyond the main offices and by the Grand Union Canal near the junction with Twyford Abbey Road. The wartime aircraft factory was located at the north west part of the site (by the canal) and to the south of the site (south of the main offices) was the secretive experimental workshop. To the east of the works was largely allotments and fields. 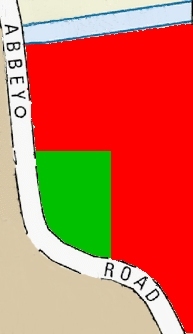 The area marked in green is the site of the Greyhound Race Track that was created by Harry Yager, the owner of Park Royal Coachworks. It was there through to, at least, the mid '60s. What replaced it I do not know, nor if PRV later expanded to take the site area. In Alan Townsin's book (Park Royal Coachworks (Vehicles) Ltd - Part 1 (1924-1944), sadly now out of print, that I mention in the PRV History page, there is a plan of the factory as it was in 1955 and an aerial view taken in the mid 60's. I recall the area quite well as I used to visit my father at lunchtimes on the occasions that I attended a school nearby that was used as overflow for our otherwise crowded facilities. We used to meet at the café situated on the north western corner of the Abbey and Coronation roads. Before the luxury of a car, my father would travel by train (Piccadilly Line) to Park Royal Station and walk across the footpath to Coronation Road, that was, in part, a footbridge over the Central Line railway situate in a cutting below. I used to accompany him on the occasions of my visits to the factory during school holidays. But what I shall never forget is the Guinness Brewery and the aroma that used to permeate the atmosphere, in particular across the bridge. The smell seemed to get trapped in the railway cutting below and enveloped the footbridge. So obnoxious was the "perfume", I recall always taking a deep breath, holding it as much as possible and running across the bridge taking my next breath at the other side to avoid the stench. Yes a stench! The brewery site is now shown as Diageo as that company now owns the Guinness brand. So over to you, my visitors, for more on the PRV site. Further reading: For an interesting insight into the history of the area, this link (Twyford and Park Royal) will download a PDF file from Brent Council's Grange Museum. Also the Brent Museum is a useful resource for heritage information on the area.